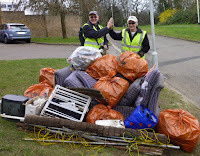 Caversham GLOBE (Go Local On a Better Environment) is for people who care passionately about our local environment. We are working to improve and protect green spaces for the benefit of wildlife and local residents, taking practical action on the ground as well as influencing Reading Borough Council policy and planning decisions. Our activities include practical events such as tree and hedge planting, rubbish clearance and graffiti removal. We work with other local community, residents and conservation groups to further common aims. Caversham GLOBE works in all parts of Reading Borough north of the Thames as well as in the adjoining areas along the riverside and into South Oxfordshire. We are a small independent community based group, one of several GLOBE groups set up in Reading in the mid-1990s with support from Reading Borough Council.